Our range of high quality products also comprises Tubular Fan that is known in the market for its precision. Equipped with a powerful motor, these fans are capable of cooling any industrial are with the help of its air blast. These products are manufactured using raw materials that are best in the industry. We have a huge team which is only involved in testing these products as per the industrial standards of quality. These products are known for their tenacity and consistency and that is the main reasons why they are so popular in the industry. 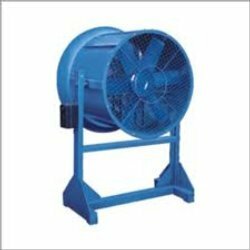 Incorporated in 2010, Ahmedabad Gujarat India Air Blow Systems is a remarkable organization engaged in manufacturing and supplying a comprehensive array of Centrifugal Air Fan, Rotary Airlock and Hot Air Generator. Under our quality-assured range, we consists of Bitumen Sprayer Burner, Pressure Jet Oil Burner, Bitumen Tank Burner, Lap Burner, Bitumen Tank and Road Plant Burner. Apart from this, we also offer Electric Burner, Industrial Gas Burner, Forced Draft Fan, Tube Axial Fan, Air Blower, Cooling Blower and several more. These Industrial Blowers & Fans are appreciated for salient feature like easy installation, simple operation, minimum maintenance and rugged construction. With the help of our experts, we are completely engaged in providing our product range within the stipulated period of time. Our organization have ultra-modern infrastructure premises in order to support our manufacturing process. We also have a good R&D division and an excellent quality control team that helps us deliver only the best quality products to our patrons. Our expert & hardworking team of engineers and salesmen contribute to on-time delivery of our products in the most cost effective way. We also provide after sale services to our valuable customers for their comfort & convenience. The products we offer conform to the international standards both in quality and customization thus helping us gaining maximum client satisfaction.